The Cleveland Metroparks Zoo is a 183-acre destination in northeast Ohio. The zoo houses over 3,000 animals, divided into multiple sections to symbolize a trek of wildlife around the world. visitors annually, the zoo also wanted to create the least amount of disruption to both primates and other neighboring habitats. 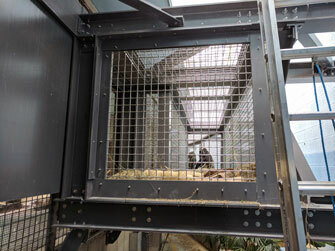 Advantic, LLC, recommended an elevated tunnel design outfitted with FRP (fiber reinforced polymers) which provided the gorillas with a 360-degree view of their habitat. 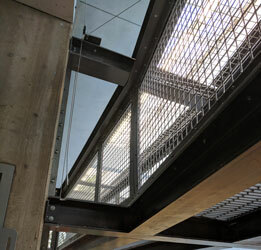 The elevated tunnel was constructed with EXTREN® wide flange beams, angles, plate, I-beams, and channels. 1.5" DURAGRID® HD-7000 was also used as the chute’s flooring, which can easily support the 450-lb. weight of a typical male Western Lowland Gorilla. to move and install heavy steel components. All FRP beams were hand carried into the exhibit through the only available access point - a single personnel door. The FRP structure was installed with four craft workers in seven days, 50% faster than the steel estimate. This reduced interruptions, loud noises, welding hazards and intrusive movement to the gorillas, zookeepers, and the public.